ForageCakes are a nutritional supplement specifically formulated to provide behavioral stimulation, aid in reducing ammonia odor, and assist with flock maintenance. 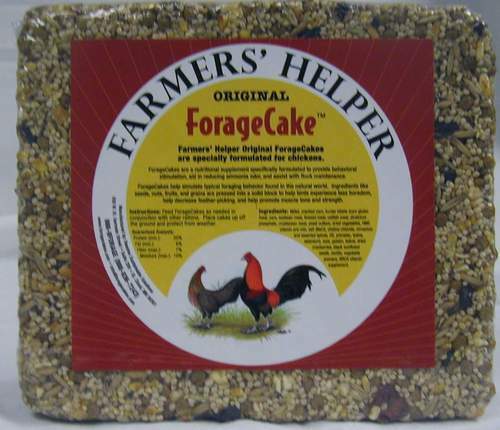 Farmer's Helper Original ForageCakes are specially formulated for chickens. Ingredients: Millet, cracked corn, hunter kibble (corn gluten meal, corn, soybean meal, linseed meal, catfish meal, dicalcium phosphate, crustacean meal, yeast culture, dried vegetables, HMS vitamin pre-mix, salt (NaCl), choline chloride, cinnamon and assorted spices, DE, primalac, lysine, selenium), oats, gelatin, tallow, dried cranberries, black sunflower seeds, zeolite, vegetable pomace, NRCS vitamin supplement. 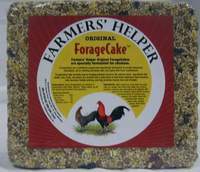 Farmer's Helper Optimal ForageCakes are specially formulated for mixed flocks. Ingredients: Hunter kibble (corn gluten meal, corn, soybean meal, linseed meal, catfish meal, dicalcium phosphate, crustacean meal, yeast culture, dried vegetables, HMS vitamin pre-mix, salt (NaCl), choline chloride, cinnamon and assorted spices, DE, primalac, lysine, selenium), millet, cracked corn, gelatin, tallow, dried cranberries, dried blueberries, sunflower hearts, nut pieces, cinnamon, zeolite, vegetable pomace, DE, NRCS vitamin supplement. Let's face it, rearing young chicks can be messy and frustrating. A large percentage of chick starter ends up wasted and boredom often results in destructive feather pecking and cannibalism. Used together with your favorite daily maintenance chick starter, our Babycake Supplement brings the free range into the brooder! Designed to provide behavioral stimulation. BabyCakes do not fit in the cage. Suggested for chicks 14 days and older.